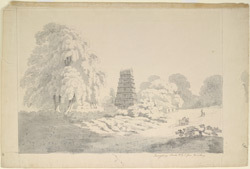 Pencil and wash drawing by Elisha Trapaud of the north-west view of the temple at Trivagherry, near Pondicherry, dated c.1806. Inscribed on front in ink: 'Trivagherry. 18 miles W by S from Pondicherry'. Tamil Nadu has thousands of temples with tall pyramidal towers intricately carved with sculptures of the Hindu divinities which were erected during the Chola (900-1250 AD), the Pandya (upto 1350), the Vijayanagara (1350-1560) and the Nayaka (1600-1750) dynasties. These huge towers or gopuras lead into the various enclosures of the temple complexes. This drawing shows a multi-storeyed temple gopura with a vaulted roof and arched ends.